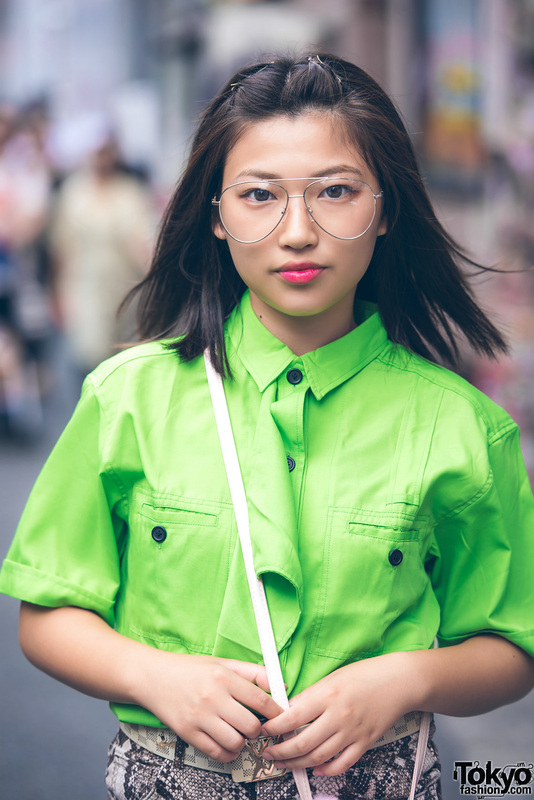 We met 17-year-old students Rika and Ribonchan while walking around the streets of Harajuku. They caught our eye with their colorful fun styles. At the left, Rika is wearing a green Koshino Junko button down shirt, H&M snakeskin print shorts, pink knee high socks, Wego platform black shoes, and a pink fuzzy sling bag, also from Wego. She accessorized with eyeglasses and a belt. Rika’s favorite brand is RRR by Aiba Runa and she loves the music of Kyary Pamyu Pamyu. Follow her on Twitter and Instagram. 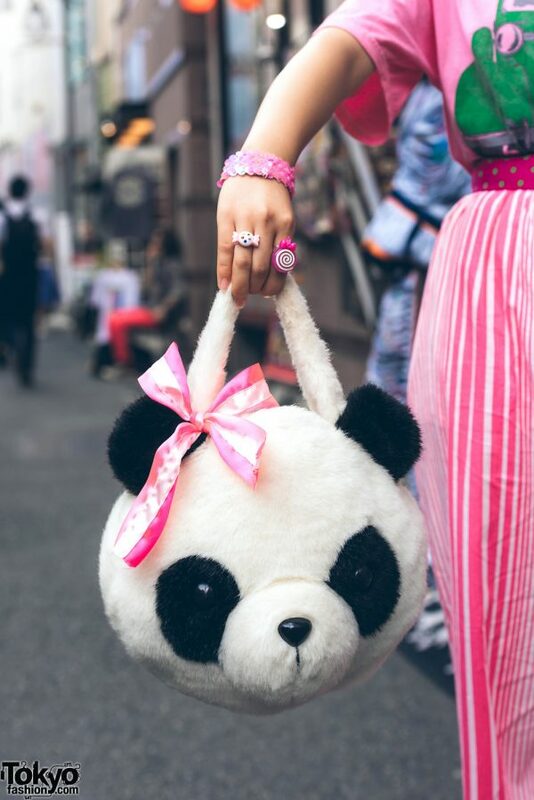 At the right, Ribonchan’s pink ensemble features a pink t-shirt from WC Harajuku, striped pants from Kinji Harajuku, fuzzy sandals from YRU, and a resale fuzzy panda head handbag. Her accessories, from Spiral Toy Shop, Candye Syrup and Wego, include hair bows, a pink belt, a sequin bracelet, and candy rings. 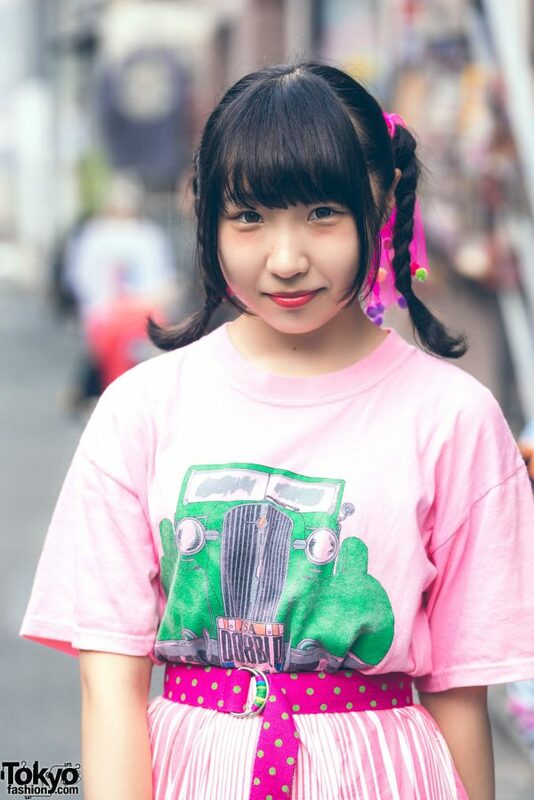 Ribonchan’s favorite shops is Kinji Harajuku and she likes the kawaii Japanese brand Candy Stripper. She enjoys the music of Kyary Pamyu Pamyu. Follow Ribonchan on Twitter and Instagram.